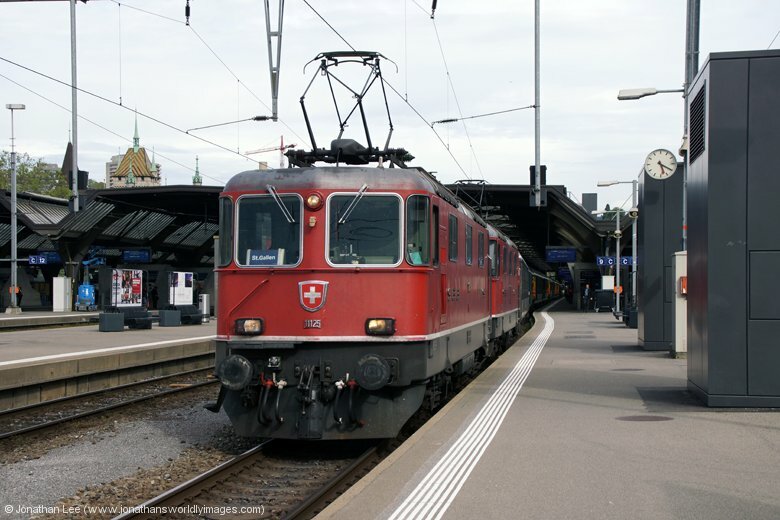 I stirred to open the blind after we’d departed Buchs and could see the booked SBB Cargo Re421 on the front as we twisted and turned following Lake Zurich as we headed towards Zurich HB. Breakfast was presented to me shortly after I got up; croissant, coffee & orange juice, along with my tickets returned. 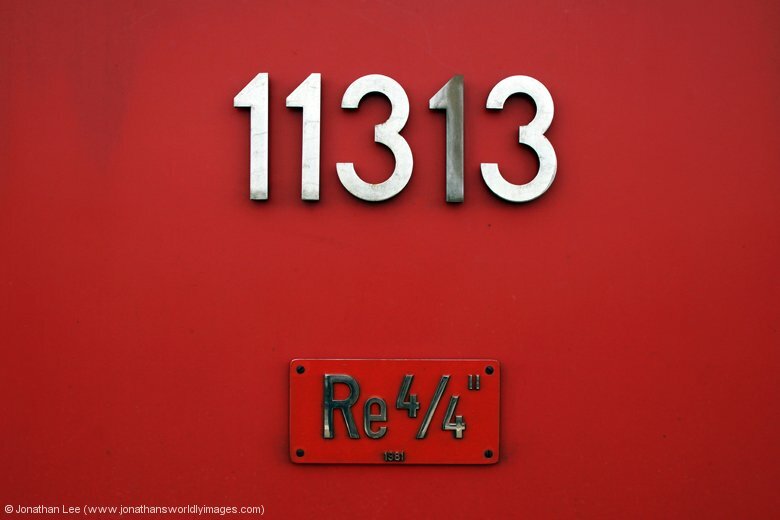 We weren’t late into Zurich and as I rushed past the blocks I found 421379 at the head of my train. 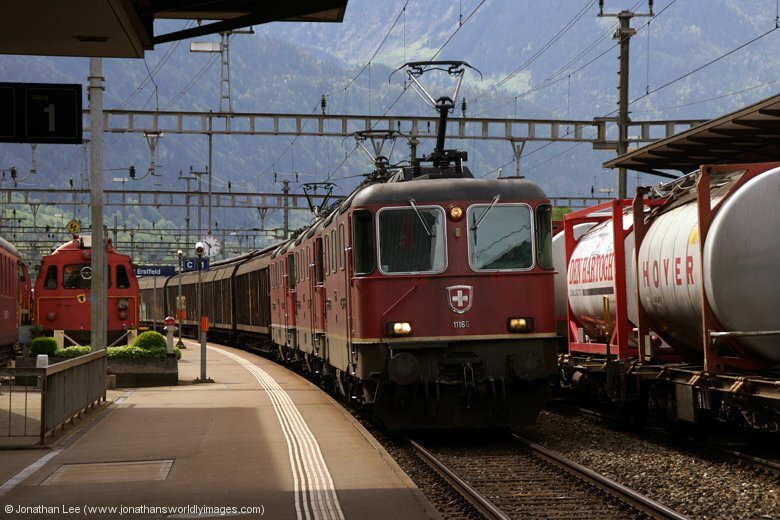 With a little time to kill before my plan to do 18045 0821 Altstetten – Einsiedeln I headed straight downstairs to doa few Re450 moves on the morning commuters, finishing nicely with Lion Re420’s 207/218 on 19124 0701 Schaffhausen – Altstetten where I was presented with SBB Re420 11147 on 18045 to Einsiedeln. Having never done the track before I was impressed with the scenery and the gradients that the Re4/4 tackled with ease. 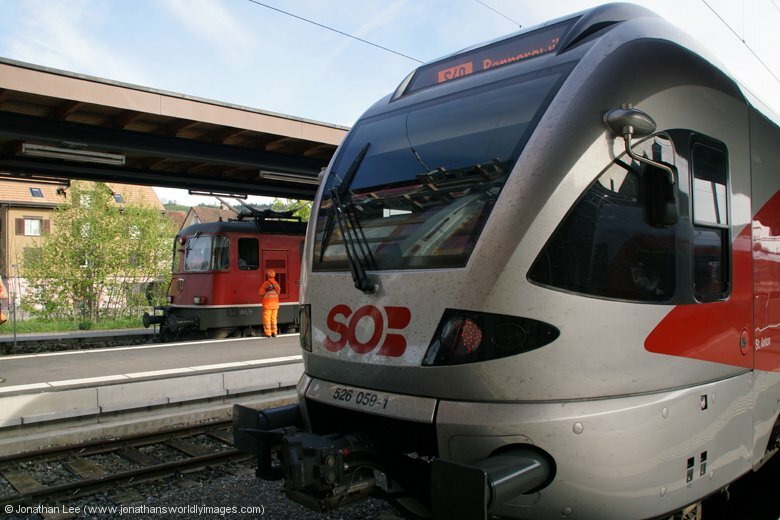 As we were a few late into Einsiedeln I had to run round onto the EMU back to Bieberbrugg, where I would enter the unknown world of SOB and the Voralpen Expresses. 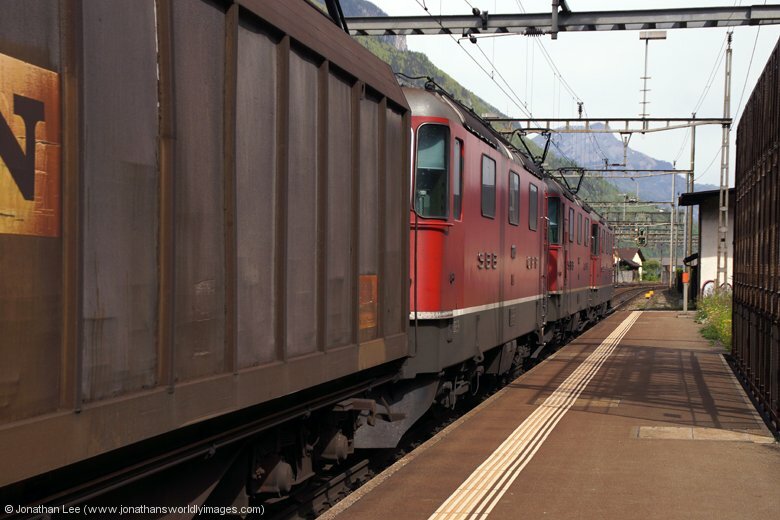 SBB Cargo 11313 was the cargo loco on hire to SOB at the time and I suspected it would be a waiting game trying to find it amongst the usual Re456’s and EMU sets; I was wrong and yet very pleased as it rolled in on the very first Voralpen Express I viewed, VAE2410 0805 St Gallen – Luzern, leading and with 446015 on the rear. 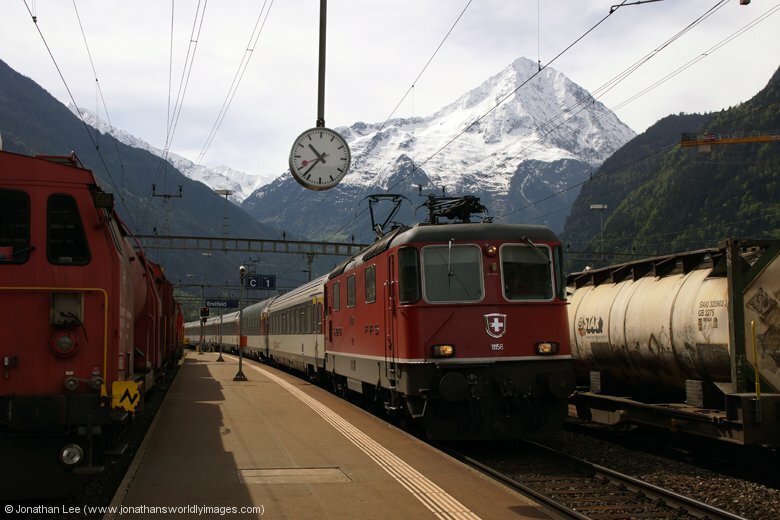 Having got it in straight away I became a bit more relaxed about the moves on the Voralpen Express trains and figured out that I could actually do a move to Erstfeld and back from Arth Goldau while 11313/446015 went to Luzern and back; and what a move that turned out to be too……. 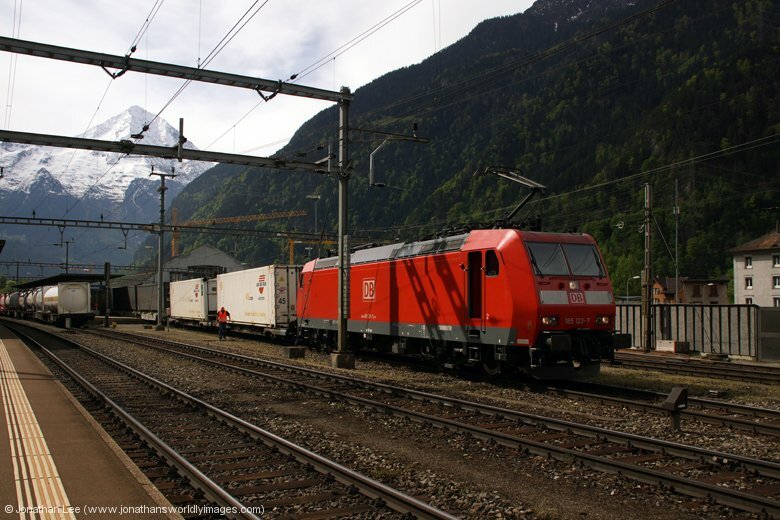 Having passed 456095/092 on VAE2417 0840 Luzern – St Gellen en-route to Arth Goldau all sorts of moves were passing through my head as I headed to Erstfeld on new Re420 11150. 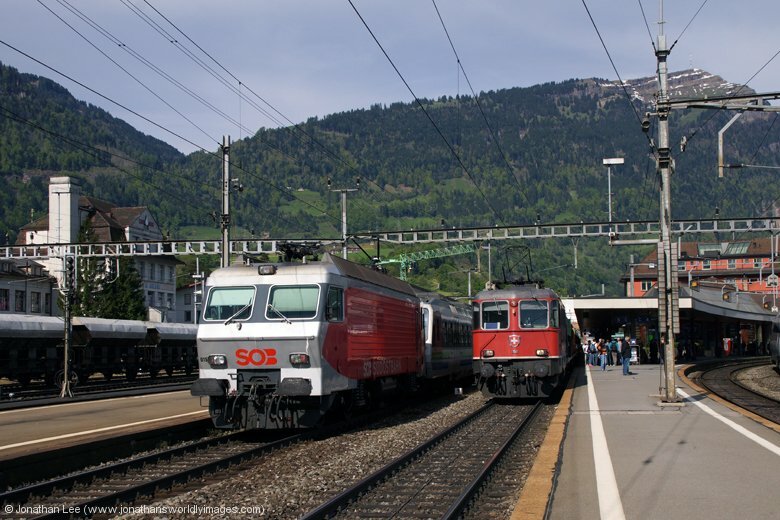 Upon arrival it seemed that Erstfeld would soon come to a standstill as once 11150 had set sail for Locarno a triple headed freight, headed by SBB Cargo Re4/4’s 11166/267/190 blocked the same platform while it had a crew change, the others already being blocked by another freight that was having a DB 185 attached to the rear as banker and a pair of BLS Re425’s. 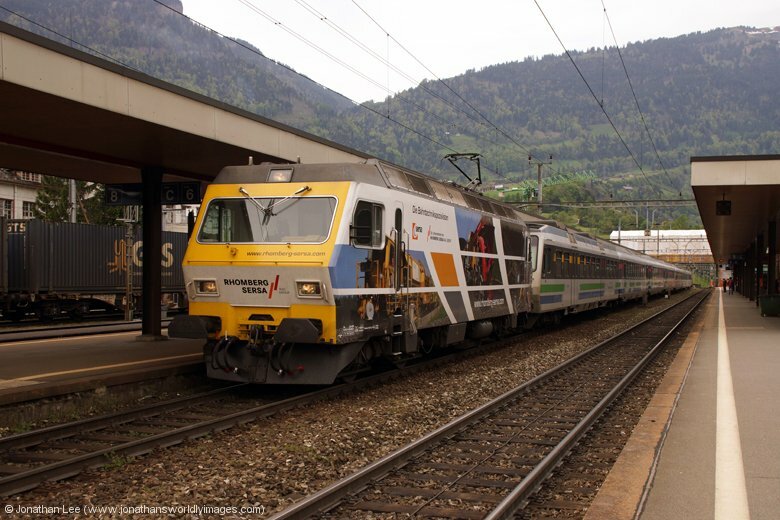 This resulted in SBB Re420 11158 working IR2268 0847 Locarno – Zurich HB being late away from Erstfeld; the plus looking a bit dodgy at Arth Goldau onto 11313/446015 on VAE2411 1040 Luzern – St Gallen but it made, thanks to the Voralpen Express being 5 late. 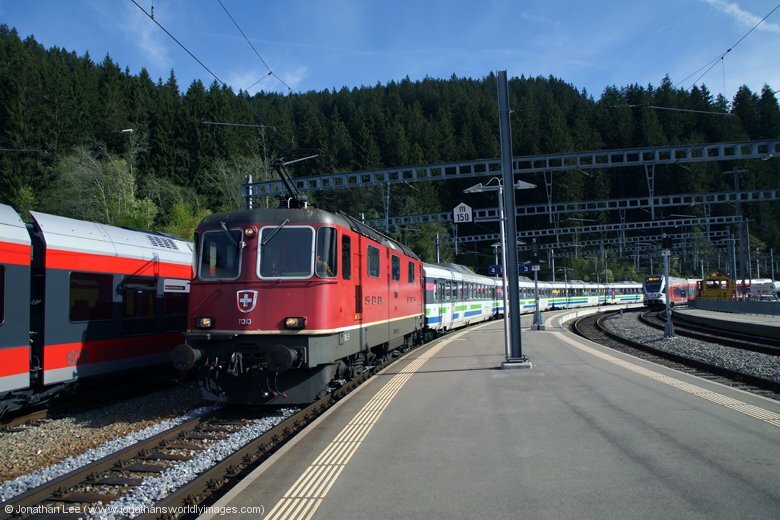 Move sorted I had already decided I was getting off at Pfaffikon for 456092/095 back and when I passed 456094/093 between Arth Goldau & Bieberbrugg I had a brainwave that had me doing 092/095 to Kussnacht am Rigi for the cross platform leap onto 093/094 back to Arth Goldau. 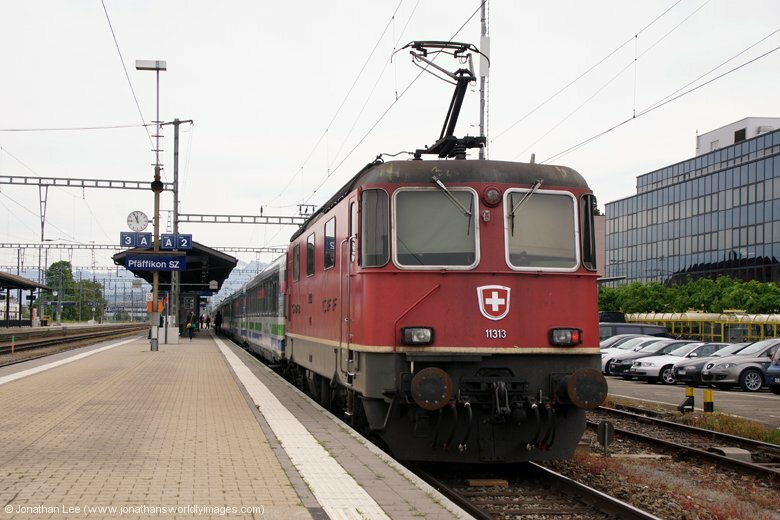 Even though it was effectively a minus at Kussnacht am Rigi both trains were rolling in at the same time and it made without any flapping, 456093/094 dropping me nicely into SBB Re420 11156 at Arth Goldau which I did to Zurich HB on IR2272 1047 Locarno – Zurich. 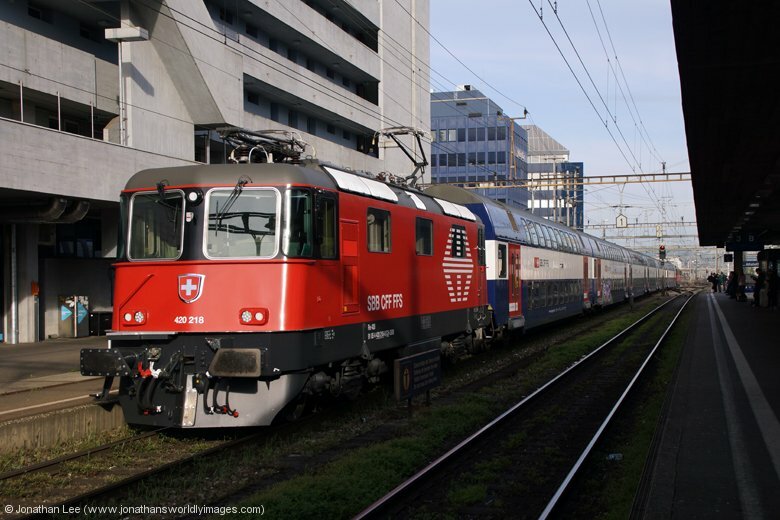 Having had a great morning I was kind of short of a plan at Zurich really until the afternoon commuters started to produce yet 11156 hadn’t made it to the blocks when a move seemed to present itself to me, completely out of the blue. 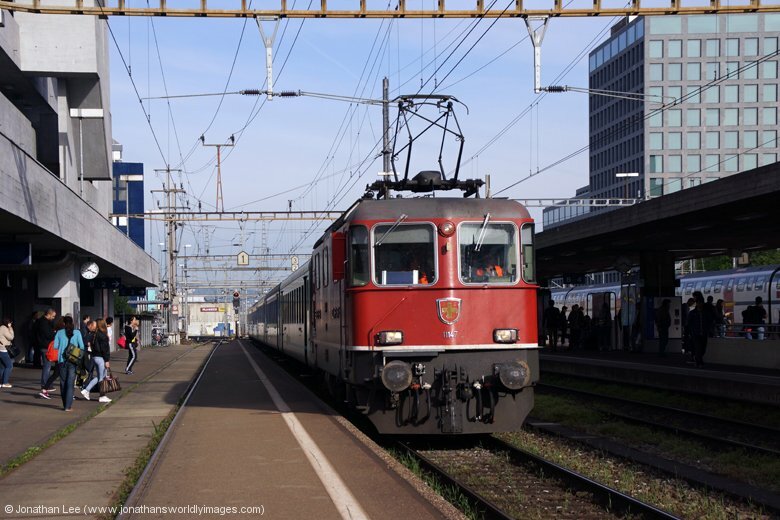 I’d noticed a push-pull set a couple of platforms across from me as we arrived and went to investigate, only to find SBB Re420’s 11148/172 coupled to the rear, in multi, being prepared to depart with IR2206 1357 Zurich HB – Bern! 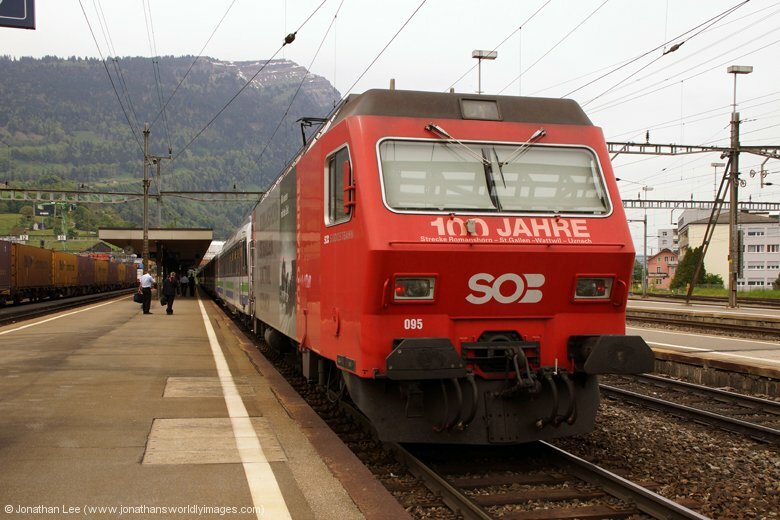 Whilst on the Re4/4 diagrams I’m not sure what should actually happen with IR2206 as the loco is shown dead in train to Olten only, yet there were two locos and I was guessing that SBB were a set short so had used the whole rake to form the service, not just the loco? 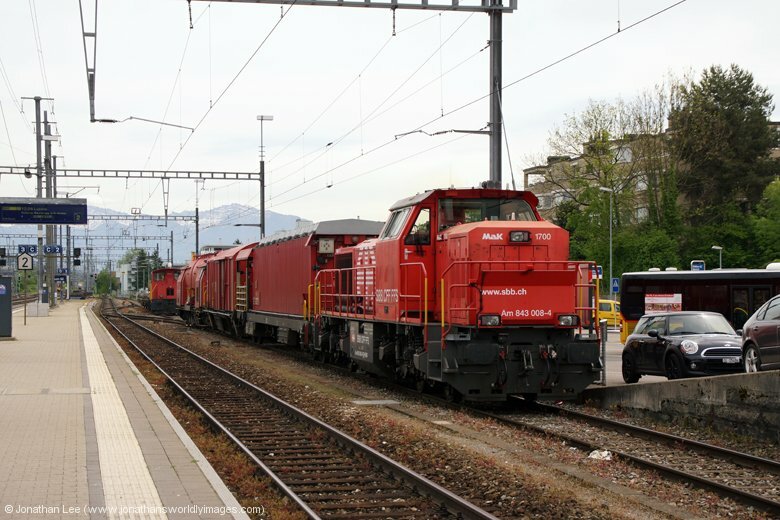 Whether one was detached or not at Olten I don’t know as no sooner had we stopped was I under the subway to find yet another new Re4/4, 11115, heading into Luzern on IR2177 14040 Basel – Locarno so was on board in a flash and Luzern bound. Re460 460081 was sat waiting at Luzern with IR2350 1510 Luzern – Zurich Flughafen and conveyed me back to Zurich to see what the afternoon commuters could offer up. 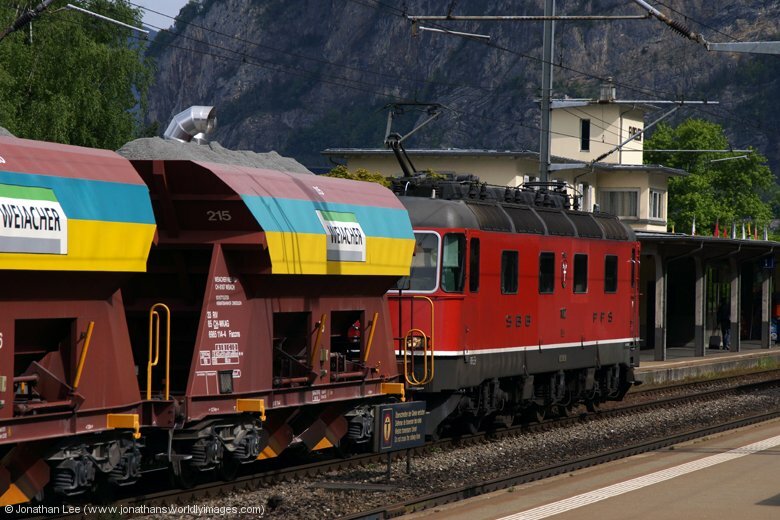 Unfortunately all the Re420’s on Lion sets that I saw were dud, as was Re420 11156 working RE3535 1641 Zurich HB – Luzern, it having been swapped off diagram as it should have done IR2279 1609 Zurich – Locarno by diagram, so my afternoon in Zurich was spent doing Re450s again. 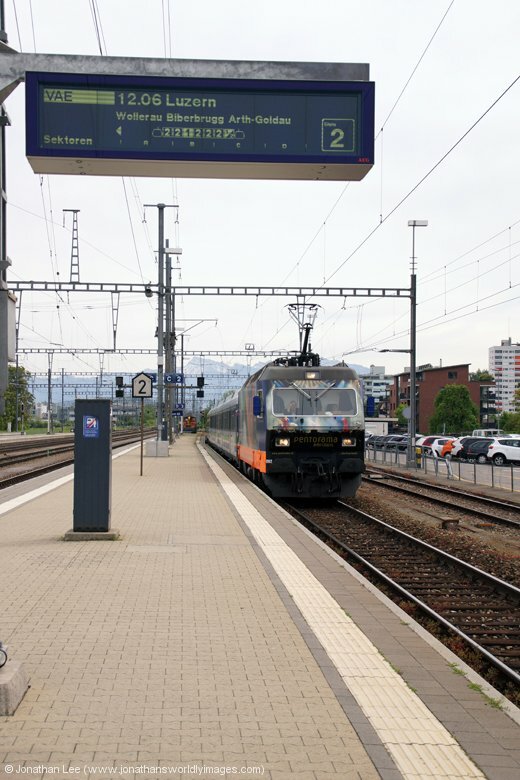 One thing to note was that ICE272 1700 Zurich HB – Hamburg Altona was formed of Re420 11155 on a push-pull set! 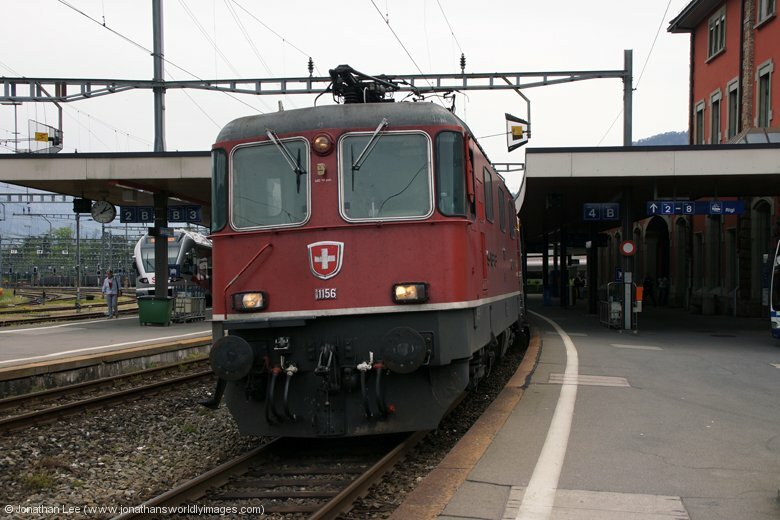 Thoroughly pleased with my splash & dash day in Switzerland I walked down the platform at 1720 to find Re420’s 11125/11153 at the head of Re3831 1733 Zurich HB – St Gallen, which topped the day off nicely as I did them throughout for SBB Cargo Re421 421394 forward to Lindau HB on EC197 1816 Zurich HB – Munich HB, where DB 218’s 218464/444 worked the train forward to destination; but with me only on board to Kempten. 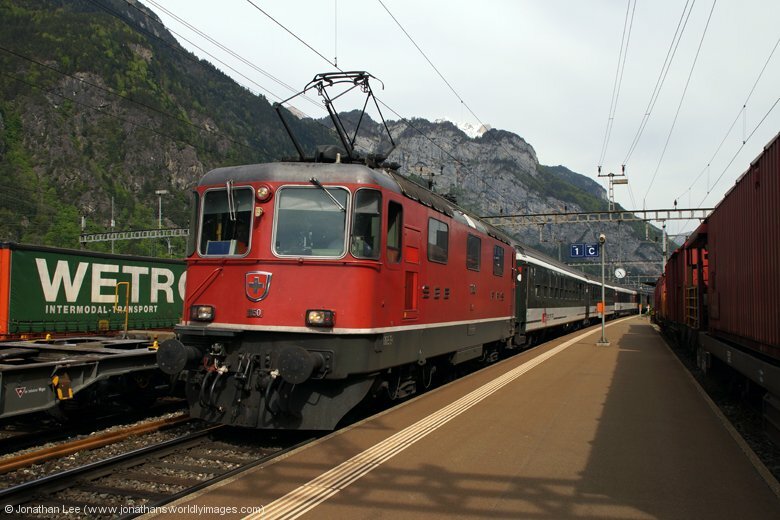 As I alighted at Kempten I found Alex 223065 on a load 2 set, which was clearly the Alex Oberstdorf portion set and engine for the morning; which already had me rethinking my plans for the following morning with no freight engine on the Oberstdorf portion. 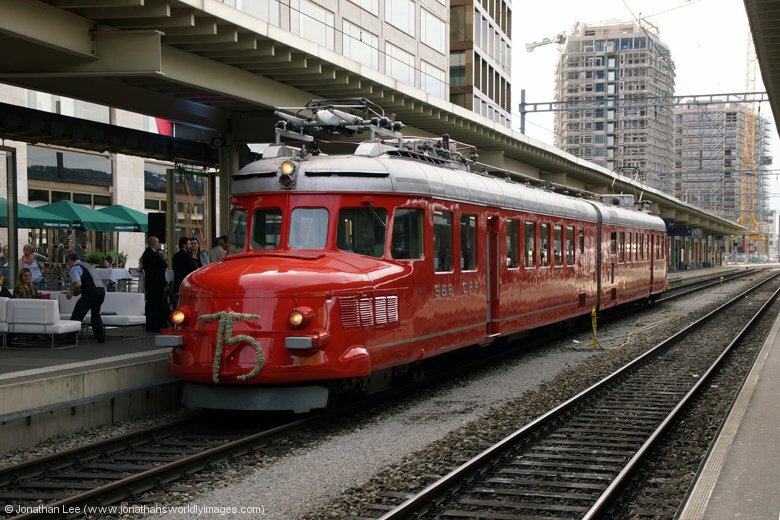 What had surprised me about the whole day was just how empty the trains I’d done in Switzerland had been, the Voralpen Express trains had given me almost a whole coach to myself on each one I’d done, the Locarno IR’s were far from full and even the EC to Munich was less than half full. My lodging for the night was at the Green Living Inn, which was a 5 minute walk from Kempten station. As the reception closed at 2100 I had been given a code for a locker at the hotel’s entrance. Said code opened the door and inside was my room key, room number, receipt and code for the WiFi. The place was quiet, clean, and spacious and for the price very well equipped with each room having its own fridge and microwave oven. I got the impression that the whole building was used for student accommodation mostly; I could be wrong though? Despite splitting up from Aidy the previous day the gen he provided me from his sightings in Munich helped me plan out a bash for the following day, especially now I wasn’t bothered about doing the Alex Oberstdorf portion with 223065. Once sorted I had that final night derance and bag packing correctly session before hitting the sack.